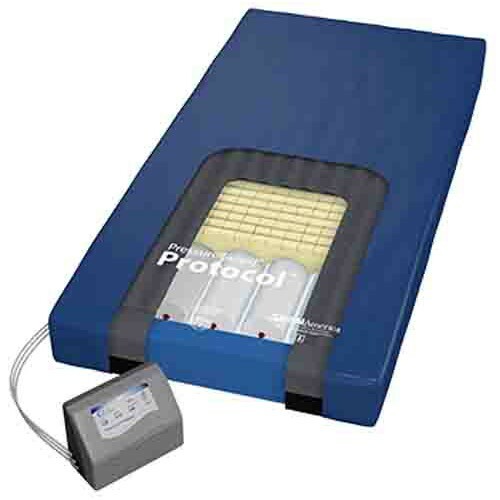 PressureGuard Protocol Alternating Pressure Mattress, manufactured by Span America, is an effective, efficient, and overall exceptional mattress to alleviate discomfort from decubitus ulcers, more commonly known as bed sores. To effectively alleviate pain, this pressure mattress features an integrated air system for the combination of envelopment, immersion, active therapy and shearing reduction. The integrated air system gently changes loading across the surface in 10-minute cycles. However, there's also an "auto firm" function that increases stability during transfers, activities of daily living, and if needed, cardiopulmonary resuscitation. During power interruption or outages, PressureGuard Protocol Alternating Pressure Mattress can retain its inflation during transport and therapy. In addition to offering pressure redistribution, the PressureGuard Protocol Alternating Pressure Mattress features microclimate management, a technology that controls excess moisture to protect vulnerable skin. Though the complementary cover allows the diffusion of air to protect your skin, it is fluid-proof which is great to protect the mattress from urinary incontinence or other liquid accidents. To clean the cover, you can either wipe it clean or launder it in a machine. This alternating pressure mattress, unlike other pressure systems, generates significantly less noise and consumes less than half the power of other roll-up surfaces. To operate this mattress, you need to use the Protocol control unit. This unit is relatively small and easily transports. It also features right angled, swivel connectors and flexible air lines and heavy-duty mounting hooks to bolster it to a wall. Upgrade the quality of care with the PressureGuard Protocol Alternating Pressure Mattress. To effectively alleviate discomfort from decubitus ulcers and bed sores, order the alternating pressure mattress today! Audible alarm and light indicates low pressure notification. Auto firm function for stability during transfers, ADLs, and CPR. Durable mount for Protocol control unit. Maintains inflation during power interruption. Minimizes risk of falls and entrapment. Perfect for vulnerable skin types. Reduces maceration on sensitive areas. Redistributes pressure away from vulnerable areas. Product Numbers: P7535-29, P8035-29, P8435-29, 3400. Mattress Weight: Approximately 22 lbs. Protocol Unit Weight: 11.5 lbs. Protocol Unit Voltage: AC 110-120V. Protocol Unit Frequency: 60 Hertz. Application: To alleviate decubitus ulcers and pressure sores. Can this alternating pressure mattress be used on any hospital bed or does it require specific bed under it?